Two years ago, when celebrating the 100 years since the first tank rolled out, we had a special game mode. This mode had you convoy the Mark I to its destination while you were on four wheels in Lanchester armored cars. This fun and very different mode was a great way of testing gameplay changes for the future. Recently we mentioned a new branch of vehicles with a fresh playstyle was on the horizon — these beasts swapped tracks for tires. Wheeled vehicles have been through our internal testing process but now they're arriving on the Super Test, we’re focusing on having all testers try them out so we can gather data on what needs to be adjusted. We want to bring back active spotting, as higher-tiered light tanks have become passive spotters as they focus more on dealing damage. Why French? Well, they have one of the most famous armored wheeled vehicles — the Panhard — which were recently in action by several militaries. Plus, they also have a special mechanic, plug-in all-wheel drive, which gives us the opportunity to implement it in the game. Panhard vehicles are the embodiment of the armored car concept. Perfect for airborne deployment thanks to their small size and weight, Panhard helped drive wheeled combat vehicle technology in the post-war era. In real life, they are more often used as escorts, internal security, or reconnaissance on the battlefield and were a natural progression from cavalry. Due to simple maintenance and low production costs, these wheeled vehicles have always been in constant need, even after the invention of the tank. Over the years, armored cars have even been capable of handling large cannons that can take out tanks. However, our tech branch focuses on the historic scouts. Note: All these features are currently in testing and may be changed before the full release. In terms of class, these wheeled vehicles will be light tanks. They will come with significant gameplay changes, however, including a new movement mechanic. Default will allow for better maneuverability, which will be useful in tight spaces and on roads. On city maps, it’s a must! Vehicles can reach between 65 to 70 km/h in this mode. Drive will boost your speed up to 100+ km/h. But with such high speed, you will lack that little bit of control you would normally have. 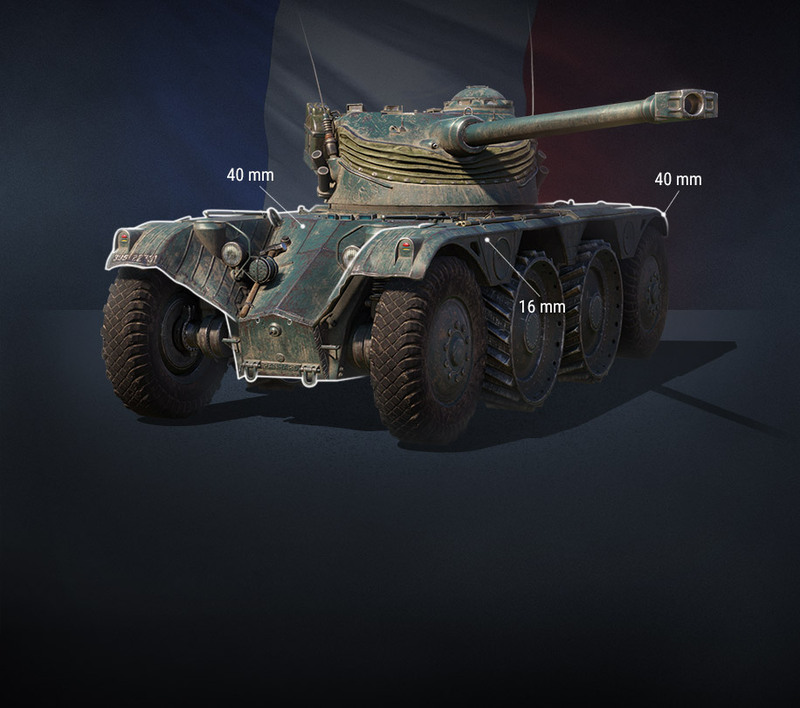 Important: The technical characteristics for the new Tier VIII vehicle are pre-balanced to check the viability of the new mechanics; they will be changed in the future. Wheeled vehicles will also have a distinct advantage over their tracked counterparts — an increased resistance to immobility as they have individual tires. These vehicles are pretty hard to immobilize (you need to damage more than half of the tires), and are more likely to just be slowed down a bit when a tire pops. Compared to light tanks directly, these have some strengths but also some drawbacks. 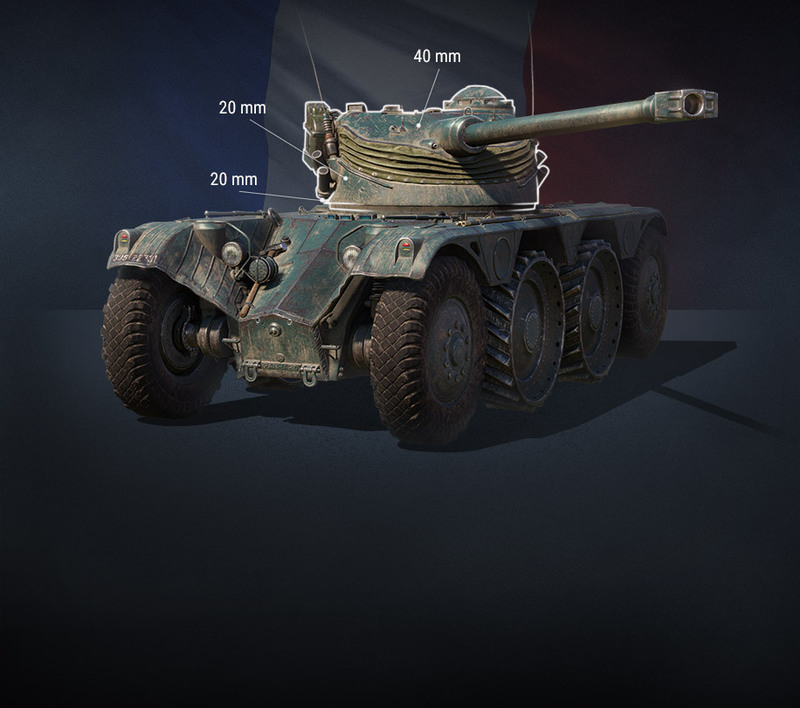 The job of the wheeled vehicles is to actively spot, which results in a worse view range over the battlefield compared to the lightly armored tanks. But their job is to be close to the action to fulfil their job in active scouting. This gameplay role takes advantage of their high speed, maneuverability and low silhouette. But they also can be used as a distraction and annoyance to the enemy team while dealing some damage when faced at close range with slow targets with little armor on their own. Think of them as a mosquito: quick, nimble, and aggravating, but taken out with one precise hit. Wheeled vehicles also have a special lock-on feature. This allows players to automatically aim at enemy vehicles just by simply clicking when close to the target. Finally, each tank will have a charge that will allow a head-start when activated to help you dodge enemy fire when you’re in a tight spot. It’s important to note this is the first stage of a rigorous testing process. This test is focused on the gameplay concept, therefore characteristics are not final. We want to make sure these vehicles can serve their purpose on the battlefield in the current game environment. Only after this will we start to tune and balance the Tech Tree. All these details will come later in a separate article detailing the Tech Tree.